Keep painted surface on the body or other parts free of clutch fluid. If it spills, wipe up immediately and wash the affected area with water. Drain clutch fluid. Refer to CL-7, "Draining". Press the lock pin into the bleeding connector of the CSC, and then remove clutch tube from CSC. Pull outward on the lock pins from the connectors of the clutch damper until the pins stop, and then remove clutch tubes from clutch damper. 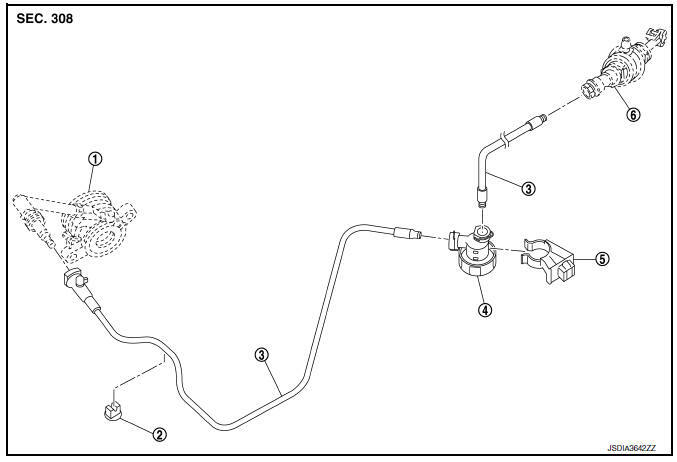 Pull outward on the lock pin from the connector of the clutch master cylinder until the pin stops, and then remove clutch tube from clutch master cylinder. Do not damage clutch tube. Install each lock pin into the clutch damper connector and the clutch master cylinder connector until it contacts the end of each connector. Check the clutch tube for cracks and damage. If the clutch tube has cracks or damage, replace it with a new one. Check the O-ring of the clutch tube for cracks and damage. If the O-ring of the clutch tube has cracks or damage, replace clutch tube with a new one. Check the clutch damper for cracks and damage. If the clutch damper has cracks or damage, replace it with a new one. Check the fluid leakage and the fluid level. Refer to CL-7, "Inspection". Check the clutch pedal height. Refer to CL-5, "Inspection and Adjustment". Perform the air bleeding procedure. Refer to CL-9, "Air Bleeding".